Sunday was really a lot more of the same. Arrive, shuffle shuffle, look left, look right, ooh and aaah, nice sweater! Lunch? Apple Crisp? Hot Cocoa? where did you buy that? Wow, I hope there’s some left, etc etc, until you realize it’s time to head home, either the place where you’re staying for the weekend or – if you’re brave enough for “The Pike” on a Sunday afternoon during leaf peeping season – actual home. Yes, I bought stuff. In addition to the Nightshades skein I showed in my Saturday wrap-up, I also purchased three skeins of Jill Draper’s Kingston to supplement the ones I had bought when she first introduced the yarn this past summer. I have a sweater in mind, not one specific enough yet to really see it clearly in my head, just a direction to start towards once I finally sit down with that yarn. I also bought two skeins of Ram Jam from Rachel Atkinson of Daughter of a Shepherd. There was also a few other purchases, a cute sewing tote from Brooklyn Haberdashery and a Sloth mug from Jennie the Potter. My Prada twin Michael Hampton handed me a skein of his signature worsted yarn and I also picked up a skein of the revived Germantown from Kelbourne Woolens: both are going straight to the front of my swatching queue. All lovely new stuff with enormous potential and quiet glimmering joy. But this isn’t what this post is really, mostly, supposed to be about. Rhinebeck meant a lot more to me this year than just acquisition, or even hanging out with friends (although that was my main reason to go). Rhinebeck was a big signal fire to me for a couple of things. So stay with me here for a minute while I meander my way through a few thoughts: Rhinebeck is a major weekend for knitters. It’s been called knitter’s Prom, knitter’s Mecca, the Mother of all Sheep Shows, and so on. It’s a big frigging deal. You can stick your finger in the wind at Rhinebeck and feel which way trends are blowing. Thank you TNNA for your legacy yarn companies and the fashion show and prognostication about the impact of Pantone colors and how Paris and New York Runways making their influences felt in editorial decisions and what yarn shops should buy, but if you want to know what knitters want, or at least the 15,000 knitters who can make their way to Downstate New York on the cusp of cold season every year, you should bring your surveyor’s transit to Rhinebeck. This year there was a dominance of a few viral knits. Tecumseh was a huge hit, rendered and personalized on the needles of many many attendees (although my favorite one wasn’t in attendance, it’s this one by Dana Williams-Johnson). I lost count at 45 on Saturday, but there were more I hadn’t seen I am sure, and Sunday brought a whole new wave of them to the fair. It’s a beautiful pattern whatever the color choice, I’m a fan. Indeed, the designer, Caitlin Hunter, seemed to dominate the “Rhinebeck Sweater”category as many many of her other designs were well represented. At the same time, I’d say Andrea Mowry’s Throwback cardigan was also super popular, frequently seen as an accompaniment to her Shift Cowl, a huge hit too for shoppers as many folks I asked about their purchases said they were on the lookout for yarn for that design. There’s a certain genius to patterns like this, approachable in their wearability, and also in their ease in how to buy for them. I already admire Andrea in a greater context for how she has broken down people’s resistance to color combining as thousands of great results beginning with her Find Your Fade shawl and running as a theme throughout all her patterns (foolproof color combining) on Ravelry suggest that it’s pretty difficult to mess up putting your choices together for one of her patterns, and by extension patterns even I design. Color is fun! Go for it! she says. She. is. so. right. I applaud both designers for their color advocacy. More and more people are choosing projects involving color work, and boy was this the year for it at New York Sheep and Wool! Watch Kristy’s 2018 Tell Me About Your Rhinebeck Sweater on Youtube here. One of a few other things I noticed this year is the dominance of Instagram as a driver of conversation. I didn’t go last year so it’s likely there was a smaller step in evolution that I missed, perhaps the leap from two years ago made this feel more dramatic. People still sport their Ravelry ID buttons, but the “Who are you on Instagram?” was a frequent first question in the “new friend” script. I picked up a bunch of new followers for my own account after the weekend, and followed about a dozen new accounts. Of course the culture at large is more and more interested in the ‘Gram, and the Rhinebeck Hashtag blew up over the weekend for sure, even though I heard a lot of people claiming to be “staying off” social media and just enjoying the show, but I think Instagram is bigger than ever if you go just by how people introduced themselves at Rhinebeck. So be it: we knit for fun, for community, and let's admit it, just a little bit of admiration. 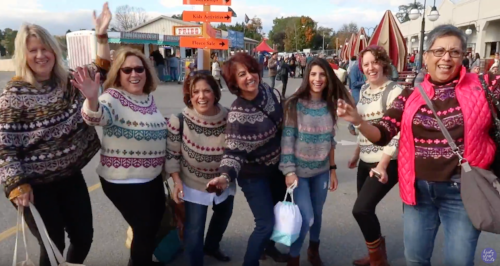 If that weren’t true, folks wouldn’t come to Rhinebeck decked out in hand knits. It’s the way we share and connect these days. We look to each other inspiration and encouragement, and what better way to stay in touch with that inspo than to add good knitters to your daily feed? I do have to say though that I miss the days when Ravelry was the community, and the community was Ravelry. I know the folks who put Ravelry together and I love them dearly as friends and as positive community builders and honest-to-goodness knitters themselves. When Ravelry was how we connected, those connections happened through the hard and thoughtful work of an honest and eager group of real people most of us could talk to in person on a regular basis at industry events, sheep and wool vests, and even at parties they hosted for us. Now we knitters connect primarily through Instagram, which is –like it or not – Facebook. Facebook cares not a lick about us or our community or whether it’s wholesome or helpful or supportive. They just want to sell ads to pepper us with. True: Ravelry sells ads too, but be honest here, it’s not the same thing. Ravelry’s ads fund the paychecks of three people. Instagram and Facebook? Facebook alone employs more than 25,000 people. I don’t know Instagram’s numbers. So which of these two, really, sits better with your sense of yourself as a member of this community of knitters? I’m not calling for a boycott or anything; I’m just saying that I miss that time. I think Ravelry is still there for us. I wish we could all remember that and continue to heartily support them right back, even if we still crave followers in an alien platform. The world moves along. I have one more thought about the weekend, and I’ll try and put words around it in the next few days. In the meantime: knit on, my friend.